Stephen Foster is the latest name to be etched into the GUKPT winners' list after topping a bumper field in Leeds over the weekend. 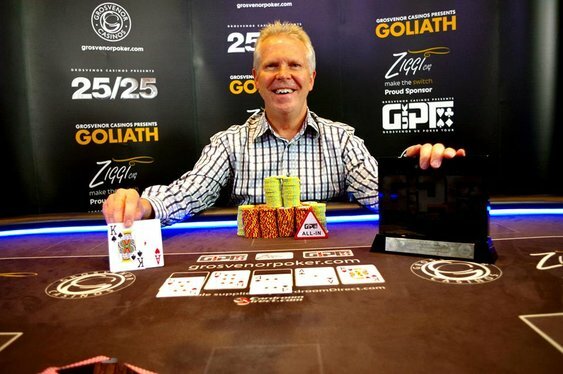 Given it's the height of summer holiday season, a hugely impressive field of 249 entries took to the tables at the Westgate Casino, creating a guarantee busting prize pool of £124,500. Local man Foster would take the biggest share of it after topping a final table that included Richard Hawes, Luke Field and recent Summer Series winner Thomas Besnier. After Simon Taberham hit the rail in third it was left to Sheffield's John Woodhead to try and derail Foster's seemingly inevitable ride to victory. He couldn't overcome a two to one deficit at the start of heads up play though and eventually succumbed after a brief two-handed battle. The chips hit the middle on a 5h6h4sAcKh board with both players tabling two-pair combinations. Foster's AK topped Woodhead's K6 to give him the title and a first place payout of £24,500. It was still a fine result for Woodhead who took home £19,500 for his efforts. That figure is all the more impressive considering he freerolled his way into the tournament after winning a local Sheffield league event! All eyes are now on the £250,000 guaranteed GUKPT Goliath in Coventry. The first of seven (!) day one flights in the £100+£20 event starts at noon on Saturday 8 August.